Is it time to shop for new tires? When it's time to buy new tires for your car, reading automobile tire reviews can help you become a more informed consumer. Tire reviews give you insight into how other drivers feel about particular brands and types of tires, and they can help you decide which tire is best for your car. These days, all tires are made with tread wear bars. These bars run across the width of the tire. As the rubber wears down, the tread wear bars are slowly revealed. When you see all or part of a tread wear bar, it's time for a replacement. You can also check your tire's tread wear the old-fashioned way. 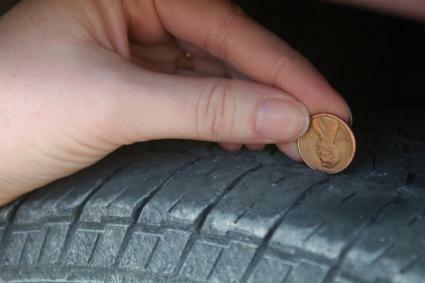 Place a penny in between your tire's treads. Roll it so that Abraham Lincoln's head is pointing downward. If you can see his hair, then the tire is worn and needs to be replaced. If part of his head is covered by the tread, then you probably still have more wear left in your tires. What Kind of Tires Do You Need? When it's time to go shopping for tires, reading reviews is a great way to get informed. As you research tire brands and read user comments, it helps to know what kind of tires your vehicle needs.Start by looking in your car's manual. All new cars and most used vehicles come with an owner's manual that provides basic information about the car. The owner's manual is the best place to find the size and type of the tires you need. If your car doesn't have an owner's manual, you can look one up online or call the dealer for more information. You can also often find information about the size of the tires by reading the sidewall. If possible, replace all four tires at the same time. Mixing new and old tires can result in uneven wear and could even possibly compromise your safety. Choose a tire that has the same or better ratings than the ones that came on your vehicle. Make sure your new tires are rated for the same speed and weight as your old tires. If you routinely drive on wet, snowy, or slushy roads, you may want to replace your tires sooner than usual. This is because the grooves in your tire help move water and snow away from the tire surface, giving you better traction. If the tires become worn, they will not be able to divert as much snow and rain. Make sure you have your valve stems replaced at the same time as your tires. The valve stem is the little cylinder that sticks out of your tire, and it's how you make sure tires are properly inflated. Valve stems degrade over time, so they should be replaced as often as tires. When you're ready to buy new tires, it pays to do your research. A set of four tires typically costs anywhere between $300 and $1500, so most drivers consider this to be a major purchase. You can save money by learning about options and researching how tires have performed for other drivers. For many people considering new tires, ConsumerReports.org is one of the best sources for objective tire reviews. You'll need to pay a small subscription fee in order to access the information, but the ratings and reviews are usually well worth the cost. Safecar.gov is the website of the National Highway Traffic Safety Administration. Here, you'll find ratings for all tires, as well as information about recalls. The NHTSA does not recommend specific models, but their information is extremely helpful. Even though TireRack.com sells tires, they have an extensive library of tire reviews. This is a great resource if you're interested in what other drivers might be saying about a particular brand. Regardless of where you get your automobile tire reviews, you'll find that doing your homework will help you save time and money at the tire store.